[129 Pages Report] The global GPU database market size is expected to grow from USD 178 million in 2018 to USD 455 million by 2023, at a Compound Annual Growth Rate (CAGR) of 20.7% during the forecast period. The study involved 4 major activities to estimate the current market size for market. An exhaustive secondary research was done to collect information on the market, the peer market, and the parent market. The next step was to validate these findings, assumptions, and sizing with the industry experts across the value chain through primary research. Both top-down and bottom-up approaches were employed to estimate the overall market size. Thereafter, the market breakup and data triangulation procedures were used to estimate the market size of the segments and subsegments. In the secondary research process, various secondary sources, such as D&B Hoovers and Bloomberg BusinessWeek, have been referred to for identifying and collecting information for this study. These secondary sources included annual reports; press releases and investor presentations of companies; whitepapers, certified publications and articles by recognized authors; gold standard and silver standard websites; GPU database technology Research and Development (R&D) organizations; regulatory bodies; and databases. Various primary sources from both supply and demand sides of the GPU database market ecosystem were interviewed to obtain qualitative and quantitative information for this study. The primary sources from the supply side included industry experts, such as Chief Executive Officers (CEOs), Vice Presidents (VPs), marketing directors, technology and innovation directors, and related key executives from various vendors that provide the GPU database software, associated service providers, and system integrators operating in the targeted regions. All possible parameters that affect the market covered in this research study have been accounted for, viewed in extensive detail, verified through primary research, and analyzed to get the final quantitative and qualitative data. The key players in the market have been identified through extensive secondary research. The market size, in terms of value, has been determined with the help of the primary and secondary research processes. With data triangulation and validation through primary interviews, the exact value of the overall parent market size was determined and confirmed using this study. The overall market size was then used in the top-down procedure to estimate the size of other individual markets via percentage splits of the market segmentation. Kinetica (US), OmniSci (US), SQream (US), Neo4j (US), NVIDIA (US), Brytlyt (UK), Blazegraph (US), BlazingDB (US), Zilliz (China), Jedox (Germany), HeteroDB (Japan), H2O.ai (US), FASTDATA.io (US), Fuzzy Logix (US), Anaconda (US), and Graphistry (US). This research report categorizes the GPU database market based on applications, components, deployment models, verticals, and regions. The global GPU database market size is expected to grow from USD 178 million in 2018 to USD 455 million by 2023, at a Compound Annual Growth Rate (CAGR) of 20.7% during the forecast period. The demand for GPU database is expected to rise over the next 5 years owing to several factors, including massive data generation across BFSI, retail, and media and entertainment industry verticals which would require high performance computing capability to process the data, availability of open source solutions, and growing applications areas. A high demand for solutions enabling high-performance computing in various data-intensive verticals creates ample opportunities for the adoption of GPU databases. Hence. GPU database vendors can monetize growth opportunities created by enterprises’ increasing interest in AI and machine learning facilitated workloads. The GPU database market study aims at estimating the market size and growth potential of the market across segments, such as component (tools and services), application, deployment model, vertical, and region. The GPU database tools segment is further bifurcated into GPU-accelerated Databases and GPU-accelerated Analytics. Vendors in the GPU database market are offering various GPU-accelerated databases and analytics tools to cater to the various data and analytics requirements of organizations across business lines and applications. Organizations are looking for data and analytics solutions to effectively utilize the massive data being generated to increase their operational efficiency and maximize their value proposition to gain an edge in the highly competitive business environment. GPU-accelerated tools with their high-performance can fulfill the requirement. They enable organizations with highly complex data streams and extreme workloads to derive insights in milliseconds reducing latency to a significant degree as compared to traditional CPU-accelerated solutions. GPU-accelerated databases with their brute force computing power can ingest vast amount of data related to customers from a variety of sources. Enterprises can analyze this data and gain real-time insights into their consumer’s buying behavior, understand market dynamics and trends, forecast demand and supply, and identify service issues and performance bottlenecks in the service chain. This high-performance computing capability is crucial to customer-focused verticals, including retail and eCommerce, telecom, and BFSI, where customer experience can make a significant difference with the highly competitive environment. The GPU databases can provide a significant advantage to enterprises by facilitating their supply chain operations and enabling them to optimize it by providing real-time, location-based insights in the entire supply chain. Many enterprises have digitalized their enterprise and field operations and are rapidly adopting advanced technologies including mobile workforce, sensors-equipped fleets, AI-assisted work stations and automated vehicles, and drones. The digitalization has led to the generation of large volumes of data in different forms and at speed is exceeding the expectations of enterprises with traditional tools and practices in place to handle the data. Enterprises with GPU-boosted data management and analytics capabilities can gain a comprehensive view of their supply chain and crucial insights to manage their value chain incorporating suppliers, distributors, logistics, transportation, and retail locations to understand and forecast demand, manage supply, and track inventory in real time. The global GPU database market by region covers 5 major geographic regions: North America, Asia Pacific (APAC), Europe, the Middle East and Africa (MEA), and Latin America. North America constitutes the highest market share, owing to the early adoption of GPU-accelerated solutions as well as initiatives taken by industry players in the form of partnerships with technology players to offer rapid analytics and data processing solutions. The US and Canada are 2 prominent markets in North America, which are witnessing healthy adoption of such GPU- accelerated tools across industry verticals. 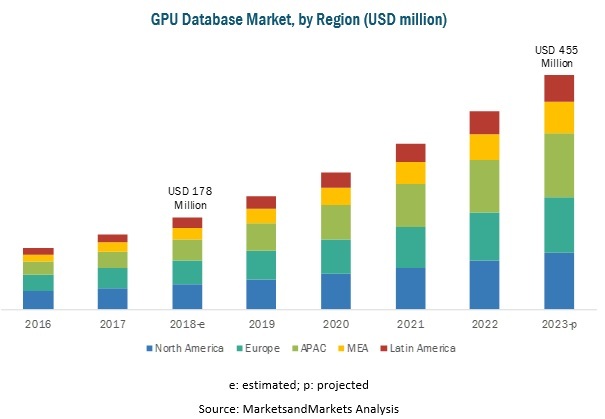 The GPU database market comprises major GPU-accelerated databases and analytics providers, such as Kinetica, OmniSci, SQream, Neo4j, NVIDIA, Brytlyt, Blazegraph, BlazingDB, Zilliz, Jedox, HeteroDB, H2O.ai, FASTDATA.io, Fuzzy Logix, Anaconda, and Graphistry. The study includes in-depth competitive analysis of these key players in the GPU database market with their company profiles, recent developments, and key market strategies. Initially, developed for the US Army Intelligence and Security Command, the GPU-accelerated platform from Kinetica has found applications across verticals such as finance, supply chain and logistics, healthcare and pharmaceuticals, energy and utilities, retail and ecommerce, government and defense, and telecom. Kinetica provides solutions for risk and fraud detection, smart-grid infrastructure management, real-time supply chain and inventory management, genomics research, real-time location-based analytics for route optimization, real-time drilling and well analytics, counterterrorism, and cybersecurity across the above-mentioned verticals. OmniSci is a leading player in the GPU database market. The company offers various solutions for data processing, analytics, and visualizations. Its flagship GPU-accelerated database product, GPU Core, uses in-memory storage. In addition, it leverages modern SSDs for persistent storage that empowers users to gain quick response even in microseconds. The company has received regular funding, which gave it the boost to innovate its products and expand its geographic reach. Partnerships with major technology players such as IBM and Google have helped OmniSci broaden its customer base. The demand for GPU-accelerated database solutions is rising gradually with an increasing need for real-time analytics. In June 2018, Kinetica collaborated with Dell EMC OEM Solutions to offer a bundled solution to develop a data platform that can correlate massive data sets across users, digital things, and edge devices. The joint solution by Kinetica and Dell EMC enables enterprises to process massive data sets and create actionable insights by combining acceleration hardware with an NVIDIA GPU-accelerated database, machine learning, and visualization engine. In April 2018, OmniSci introduced MapD Cloud, a SaaS offering of GPU-accelerated analytics. It would help users to access the fastest open source SQL engine and visual analytics platform. In October 2018, NVIDIA launched an open source GPU-acceleration software platform for data science and machine learning. It is designed to provide data scientists the tools to run entire data science pipeline on GPUs. Where will all these developments take the market in the mid to long term? What are the upcoming industry applications for GPU database? *Details on Business Overview, Tools and Services Offered, Recent Developments, SWOT Analysis, and MNM View might not be captured in case of unlisted companies.